Ruthless Cliftonville made Newry City pay for their wastefulness in front of goal with a comeback victory at Solitude last night. After taking a fourth minute lead through Darragh Noonan, the Danske Bank Premiership’s basement boys passed up a series of golden opportunities to really turn the screw on the Reds before the hosts responded with three strikes in a whirlwind eight minute spell before half-time. Rory Donnelly drew them level after a smart one-two with Chris Curran and, after Joe Gormley banked his obligatory goal, Ryan Curran wrapped things up with the hosts’ third – although the strike was mired in controversy, with Newry adamant that a Cliftonville player had put the ball out of play in the build-up. That anger need not have materialised had Darren Mullen’s men built on their bright start. A free-kick on the left saw Hughes brothers Mark and Stephen enact a training ground routine that ended with Noonan finding the net at the far post. Soon later, Stephen Hughes dragged an attempt wide after being slipped through by Stephen Teggart before Mark McCabe could only find the side netting when he looked certain to double the visitors’ advantage. 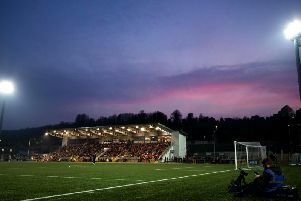 Cliftonville, who had gone close through a header from Rory Donnelly and snapshot from Gormley, heeded the ample warnings that had been sent their way and drew level on 24 minutes when Donnelly skipped past keeper Andy Coleman after Chris Curran’s delightful touch had opened a gap in the heart of the Newry defence. It wasn’t long before the Reds were in front; Rory Donnelly again involved with a teasing cross that was simply crying out for the conversion that an unmarked Gormley provided. Within three minutes, it was 3-1 – much to City’s fury. The officials’ failure to award a goal kick, rather than a corner, allowed Levi Ives to swing the set-piece in and, when the ball dropped inside the box, Ryan Curran pounced to give Coleman no chance. A raking Ives pass looked to have set Jay Donnelly up for the home team’s fourth only for Noonan to produce an excellent last-gasp challenge that maintained the Reds’ two-goal cushion at the interval. The second period failed to live up to the drama of the first, although that might not have been the case had both goalkeepers not excelled themselves on two occasions each. After Coleman produced a fine stop to stop Rory Donnelly netting with an outside-of-the-boot curler, Brush reacted superbly to keep Dale Montgomery at bay at the other end. Ryan Curran was then denied by Coleman after Jay Donnelly had somehow bundled his way through a raft of defenders, ahead of City sub Tiarnan Rushe being denied by the alert Brush. CLIFTONVILLE: Brush, McGovern, Ives, Breen, C Curran, R Curran, R Donnelly, Catney, Gormley, J Donnelly, Lavery. Subs: Neeson, Harney (Breen, 77 mins), Garrett (R Donnelly, 83 mins), McDonald (C Curran, 63 mins), Maguire, McMenamin, McNulty. NEWRY: Coleman, Mooney, King, Noonan, Boyle, McCann, McCabe, S Hughes, M Hughes, Teggart, Montgomery. Subs: Maguire, Walker (S Hughes, 82 mins), Lavery (Teggart, 74 mins), Rushe (M Hughes, 74 mins), McArdle, Mullen, Healy.